Thanks to blog reader Andi Beyer for typing up the following letter from low-quality photographs of the original newspaper. Although I intend to post letters 150 years after the date they were written, I wasn't able to post this letter two weeks ago as it's from the Lancaster Inquirer, a newspaper not on microfilm. Thanks to the work of reader Andi Beyer, you can now view the following typed copy below. The letter's author, Oscar C. M. Caines, joined Col. Hambright's regiment as part of the famed Fencibles Band. Known teasingly as "Judge Caines"--presumably because he supervised construction of the Lancaster County Courthouse--Caines left Lancaster promising an occasional letter to editor Stuart A. Wylie of the Inquirer, a formerly Democratic paper that threw its full support to the war effort and the Union Party in September 1861. I'll have more on Caines and Wylie in a post down the road. Friend Wylie: I take advantage of the first leisure day (being Sunday), that I have had, since being in camp, to fulfil my promise of writing to you. We had a rough time in getting here--Tuesday night on the road--in the meanest kind of a car, arriving at camp about 8 o'clock on Wednesday evening, ate a supper prepared by our friends, Captains Duchman and Wickersham; then marched a distance of three miles to the City Hall, each man selecting a soft plank for his bed, with anything he could find for a pillow. Those who obtained haversacks, by the kindness of the "Patriotic Daughter," fared the best--Your humble servant, having on his best duds, selected three old chairs and a carpenter's saw-buck, for a bed and pillow, and I assure you we all slept soundly until near daylight, when wishing to change my position, I fell out of bed, thus disturbing the slumbers of the fat Trombone. As you may suppose there was something said in very pure, but strong Teutonic language, which as I did not understand, I cannot repeat. At sunrise, that is if it ever does rise over this city of smoke and fogs, we started for camp, were again fed, and set to work at pitching tents, getting straw, drawing rations, and beginning our camp life in all its details; and at this time we are all conveniently quartered, and well and fully provided for in all that is necessary for our comfort.--The men are being clothed and equipped rapidly and we expect by the close of tomorrow to have all our equipments complete. We, that is us, are "all hunk," and our music attracts large crowds daily. There could not have been less than five thousand persons present at our evening parade to-day. It is conceded by all that ours is the best band that ever encamped, or was heard here. While I am writing this, divine service is being performed in camp. Nearly or quite all of the companies of our regiment, under the care of an officer, were permitted to attend church in the city this morning. The men were all orderly in their deportment, and I truly say, that they give evidence of being not only a crack, but a model regiment. Our Colonel is very energetic in perfecting his men in their duties--six drills daily--two by squads; two by companies; two by regimental parades, and guard mounting, so you can see we have no idle hours. 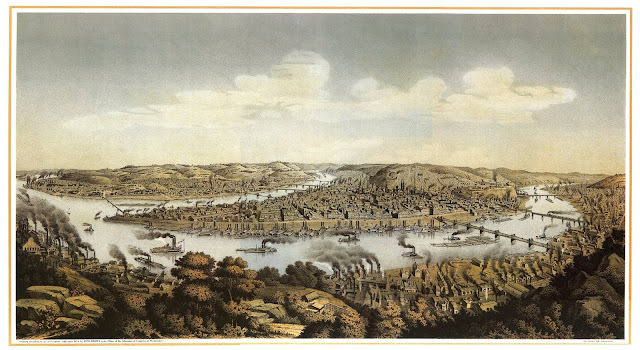 When we first came here it was generally supposed our destination was either Missouri or Kentucky; now it is thought to be Western Virginia; but be it where it may our friends may rest assured that the Rifles under the lead of our gallant Colonel will render a good account of themselves.